All of the top seeds qualified for Nationals. AURORA, Ill. — Though five bids were on the line this weekend at the Great Lakes Regional Championships, most eyes were on the matchups in the finals, where, particularly in the Men’s and Women’s Divisions, two strong, evenly-matched teams would face off for the Regional crown. 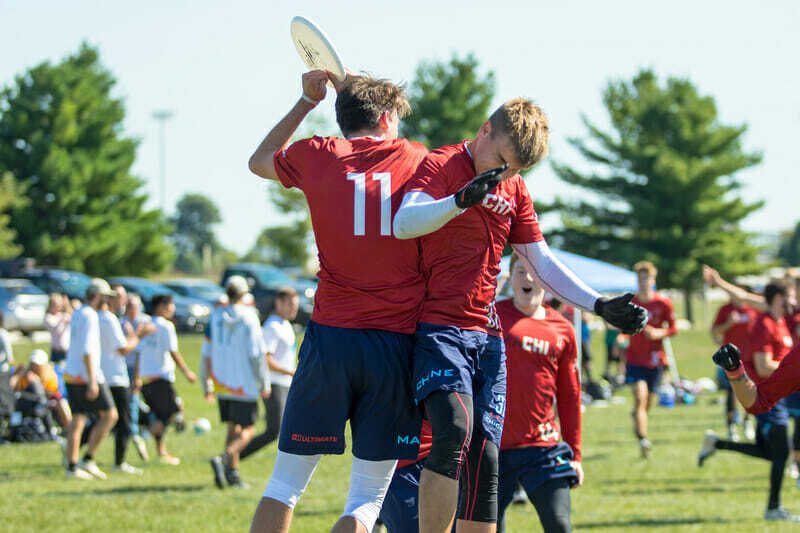 Both games delivered, and in the Mixed Division, Columbus Cocktails continued their hot streak to claim their first-ever berth at Nationals. No. 1 seed Columbus Rival and no. 2 seed Chicago Nemesis took care of business on Saturday and set the stage for their anticipated matchup in the final on Sunday morning. Despite a valiant comeback attempt and even a late lead, Rival came up short as Nemesis won on double game point, 15-14. 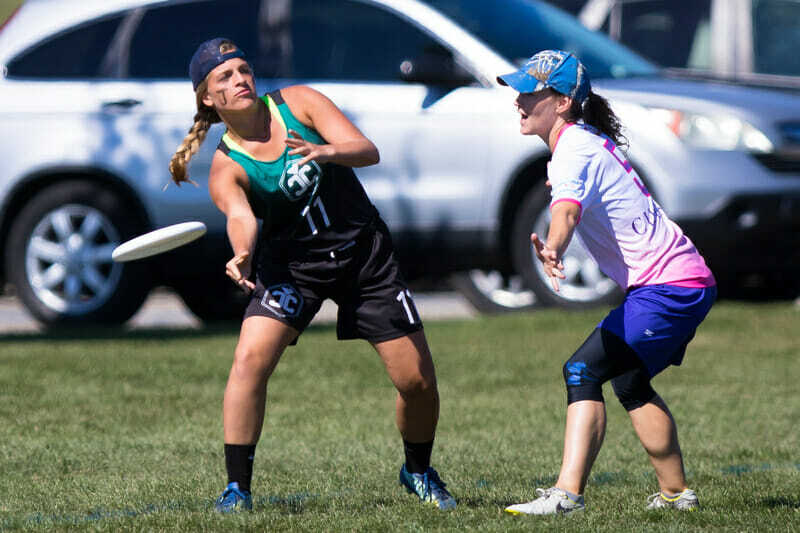 Chicago started the game on offense, but, after a turnover, Emilie Willingham had to make a gigantic goal-saving layout block for Nemesis to avoid giving up an opening break. Nemesis was ultimately able to hold. At 2-1, Chicago’s matchup defense started to rattle Columbus. Rival made some small execution errors leading to big turns. 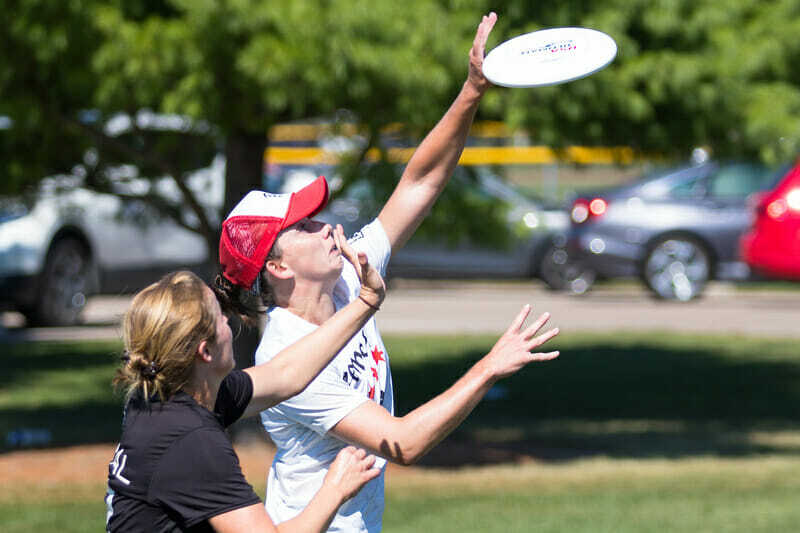 After a 3-1 run for Chicago featuring hucks to Jessi LeDonne and Erika Danckers, Rival’s Nancy Haskell took over and the execution errors started to fade. Columbus brought themselves back to within two at 6-4. But Rival’s end zone efficiency was taking a big hit as Nemesis person defense really locked in at the goal line and Chicago took half on a break to lead 8-5. Columbus was able to get a break back at 9-8, but Chicago answered with a break off another Beth Daviess huck to streaking LeDonne. Columbus then chose to throw a cup zone defense to switch things up. At first, it didn’t seem to bother Chicago’s handlers, as they got off a lot of easy swings. However, the cutters were locked down, and Nemesis started making some decision errors. Columbus struggled to capitalize on several opportunities, but there seemed to be little hope for Chicago in the zone as Rival tallied two straight breaks to get back within one, 11-10. Nemesis finally got it moving, but in a hasty effort to stop the cup from setting up again, they turned a swing. Rival’s Sara Nitz took over and came down with a huck and easy assist for a third straight break. One more break gave Columbus the lead at 12-11. The wind wasn’t stifling, but it was strong enough for the zone to be effective. Stop the bleeding was the perfect description, as they never truly mastered the zone but found ways to get through it with some calm swings and plenty of small space athletic plays. Chicago handlers Jennifer Corcoran and Allie Fish were a big component of holding on and tying the game at 12-12. Now that Chicago figured out the zone, four more holds brought it to 14-14 in a game to 15, double game point. Columbus received, and the Chicago defense quickly forced a turn just 20 yards away from the goal line. Nemesis ran their progressions and foud Corcoran open in the end zone to win the region. The high-powered Nemesis offense started strong and was able to hold on, but their intense defensive mentality is what really swung the game. That will be a driving force at Nationals. They made it a point to contain Rival’s biggest stars, and no one played a bigger role in that than Jacqueline Jarik, who was tasked with guarding Columbus’ offensive weapon Sophie Knowles. Coming off a tough DGP loss, Rival was able to recollect themselves and prepare for the second-place game in the backdoor bracket against Chicago Dish. Dish was riding high off a 12-10 win over Indy Rogue and a solid weekend all around. Dish lost to Rival 13-9 in pool play, so an upset bid wasn’t out of the question. 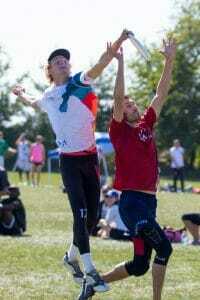 However, Rival quickly took control and coasted to a 15-4 win to secure their spot at Nationals. As expected, No. 1 seed Michigan High Five and No. 2 seed Chicago Machine met again in the finals of the Great Lakes this year. Michigan was able to beat Lombard Black Market in the semis and Chicago pulled away from a red-hot Indianapolis Brickyard after Indy was only down one at the half. Michigan came into the game with two regular season wins over Machine, but Chicago was missing a key player in both cases. With Chicago’s big names, Kurt Gibson and Pawel Janas, available this time, Machine was looking to turn the tides. Michigan’s defense was assisted by some incredible pulls from Johnny Bansfield that allowed them to jog down and still set their full defense. High Five was able to register the first break to go up 2-1 with the first of many highlights for young star Joe White. Chicago got the break back, then High Five’s Paul Arters and Gibson traded massive hucks to bring the score to 5-4, Machine. Both teams held again before Chicago’s D-line broke and sent Kurt out on defense to help Chicago get the break for half. He delivered with a huck to Walden Nelson. Chicago led 8-5 at halftime. After a High Five hold on a big huck from Kevin Baumann, Chicago committed to containing Michigan’s throwers and forcing them to work it up the field with unders and handler cuts. Arters and Keegan North had a harder time but found ways to work it past Chicago’s efficient switches and varying strategies of person and junk defense. With both teams committed to limiting the deep threats, the game got sloppier with several multiple turnover points. High Five started to chip back into the game and got a break on a Joe White score to bring the game to 9-9. Chicago called a timeout to recollect themselves. Another huge pull pinned Chicago to the back of the end zone, and despite tighter handler defense, Chicago was able to huck to Alex Evangelides and finish for the goal. On the next point, Arters threw a blade into the end zone that was taken by the wind. Machine’s D-line offense took over and put in the final break of the game on a great small space cut from Nathan Goff. Soft cap went off and the game became first to 13. Three consecutive low turnover holds followed. At 12-11, Chicago received on their game point. Some heckling spectators called for a huck to Kurt Gibson. Chicago dialed up that exact play, but Joe White made an incredible skying grab from behind to extend the game. High Five now had some crowd support, but they threw a quick turnover near the goal line. Machine handlers patiently ran their dump sets for an open look, and Tim Fergus found Janas with a scoober for the win. Machine expects to get better every day up to Nationals. There were several offensive miscommunications and errors revolving around cutter to handler resets that they will look to eliminate before going on to the big stage. While the championship game was going on, Indianapolis Brickyard was duking it out with Lombard’s Black Market. Indy was looking to retain their Top Select status and get another chance at a game-to-go. Indianapolis was able to pull off the win on double game point. Again, there was an opportunity for a streaking underdog to take down a tournament favorite. Like Columbus Rival before them, though, Michigan quickly gained control of the game and qualified for nationals with an easy 15-7 win. First seed Columbus Cocktails didn’t get the anticipated rematch with Cincinnati Steamboat in the final. Instead, after Steamboat lost early in the bracket, they took on Chicago’s Nothing is Great Again (AKA Babymaker). Cocktails took advantage of their opportunity, taking half 8-1 and coasting to the 15-7 win to qualify for their first ever Nationals. Columbus has a well-developed offense with quick give and goes and pinpoint throws, led by players Sion Agami, Ben Sever, and Caitlin Duffner. They had some good defensive schemes featuring Emily Barrett and Sadie Jezierski all weekend with brackets, a 3-3-1 zone look, and great person defense. Columbus’ versatility was one reason why they went undefeated with a point differential of +48 and was able to adapt to a relatively unknown opponent in the final. Another major reason why they walked through the region: other teams were doing the dirty work. The biggest challenge Columbus faced was fourth seed Tequila Mockingbird out of Chicago/Indianapolis in the semis. The rest was taken care of by Chicago Babymaker. Chicago Babymaker was dangerously under-seeded as the seventh seed after a 3rd place finish at Central Plains Sectionals. Chicago didn’t have any regular season games but carried several players with Nationals experience. They had the throws to expose any matchup they liked. Teams struggled to adjust, and Chicago took advantage by going undefeated in their pool and upsetting second seed Toast. This forced Toast to go through prequarters, where they ultimately lost. This all set up Chicago for an easy path to a semifinals game vs Steamboat. Cincinnati may have been an underdog as the no. 3 seed to win the region on paper, but they won the region the last two years. Cincinnati hushed doubters on Saturday and made quick work of their pool, giving up only 12 points in three pool games. High roster turnover dampened their regular season, but they looked to be firing on all cylinders on Saturday. Cincinnati then took down a makeshift, veteran-heavy team of Ohio Commitment Issues in quarters. The semifinals game was a barn burner. Cincinnati’s precision — led by returners Brittany Winner and Jeff Haney — clashed with Babymaker’s ability to make big plays out of nothing. Chicago’s playmaking was particularly highlighted by a huge layout block on double game point. Chicago was able to win it 16-15. But Cocktails were the stars this weekend. They are now on a 17-game winning streak. They’ll look to extend the streak against much stiffer competition at Nationals, where they will be one of the bottom seeds. The rest of the country has significantly outclassed the Great Lakes in the Mixed Division all year. Columbus lost all of their games in the Elite-Select Challenge, but the team is excited for another shot to prove themselves at the biggest tournament of the year. Jon plays mixed in the Chicago Area. He is a glorified reset stall button for other handlers. 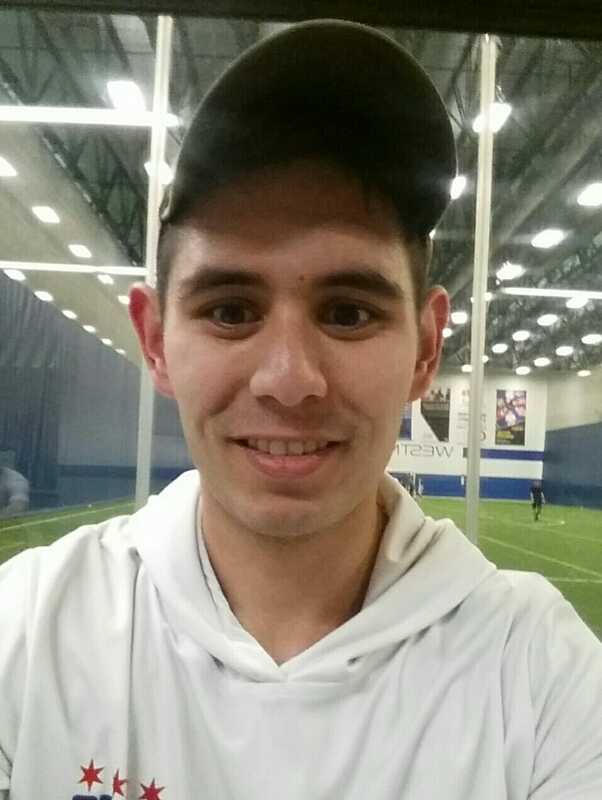 He is an alumni of Illinois Ultimate where he was treasurer for two years as well as a B-team captain. Comments on "Great Lakes Regionals 2018 Recap: Nemesis, Machine Grind Out Wins; Cocktails Qualifies For First Time"